I have no doubt in my mind that the chance of me felling a tree and then taking the time to hand hewn it is pretty much zero. But that didn’t stop me from attending one of my favorite classes this year at Woodworking in America 2013. 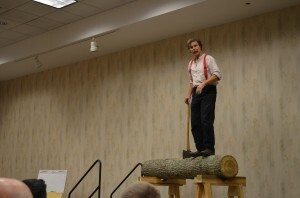 The opportunity to sit in Roy Underhill’s class “TIMBER!! !” to see him demonstrate an aspect of woodworking that is so far out of my scope of accomplishing, was worth every second I sat in the lecture hall. I will admit there was some morbid curiosity as I wondered if something would happen when he started swinging the axe for real, but what I discovered instead was that the more Roy swung a tool, the more I learned. The more Roy sent wood chips into the audience, the more I understood how and why it might be important to learn how to hand hewn my own log…although I still have no idea when I’ll ever do it. Perhaps you’re into timber framing or just really want to try something like this yourself…because you have a fireplace mantel just waiting to be made out of that pesky tree in the yard? Attending this class was a great way to get my experience at Woodworking in America 2013 off and running. Thanks Roy! Thanks for posting the video, Matt. I missed that presentation, and I’m glad to see the highlights.